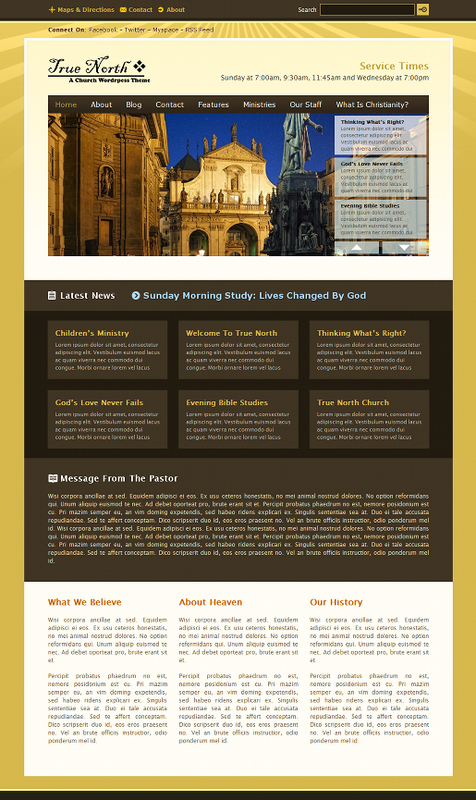 Built specifically for churches as a platform that allows for complete management over the website, True North is the perfect solution for small and medium sized churches who need an easy-to-use website without any hassle. True North has a considerable array of custom features to display upcoming services, contact info, social networks, operation times, and more. All these tools will help you bring your services and information swiftly to anyone who visits your site! Homepage. The most important place and the heart of your site, the frontpage. True North allows you to customize nearly every aspect of your sites frontpage; a brilliant image banner, latest news, custom messages and more! Custom Control Panel. Built from the ground up, ArisTech Panel is a powerful, easy to use, Ajax powered, theme options interface. It is the core of the True North theme. The ArisTech Panel contains dozens of options that will allow you to control nearly every aspect of the theme from the header to the footer. It even includes a Google Analytics option (or other popular tracking service)Â to keep track of your sites visitors. Navigating from panel to panel is a breeze with the power of the sleek jQuery animation engine. It even uses Ajax to update your settings within millisecond after clicking save. The ArisTech Panel is why you will love modifying your theme exactly the way you want it. 9 Built-In Sidebars. True North is shipped with 9 built-in sidebars that cover nearly every aspect of your web site. Drop widgets into any of the included sidebars from latest news and frontpage promotions to blog posts and pages. 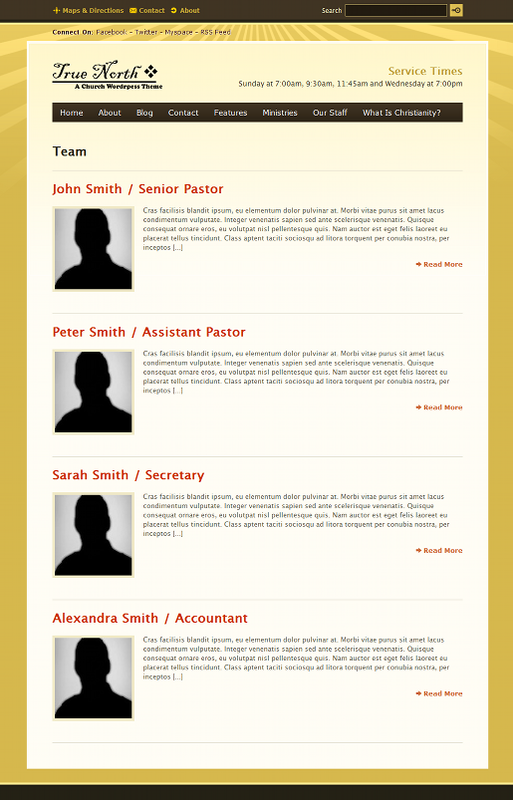 There is even a Footer Columns sidebar which allows you to display a variety of widgets at the bottom of your web site. 6 Custom Widgest. 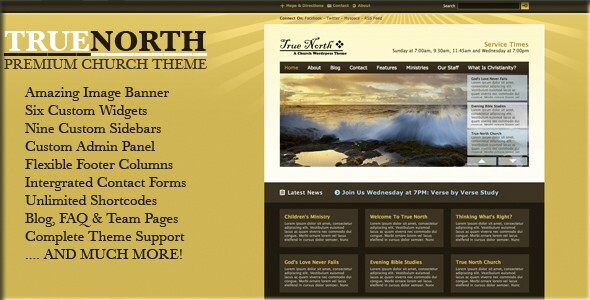 True North comes with five custom designed widgets to add more functionality to your site. These custom widgets allow you to display aÂ contact form,Â contact information,Â social networking links,Â latest news promotions, latest news promotion listsÂ andÂ PayPal donation links. Betabin. Betabin is a custom image upload handling system built by ArisTech Media specifically for True North. Uploading new images is fast and simple. Just clickÂ Upload, choose a file from your computer, and Betabin instantly uploads your image.Â Once images are added to Betabin, you can re-use it for multiple parts of your theme; you can even use it within widgets! Betabin makes it swift to add or remove images to your theme. 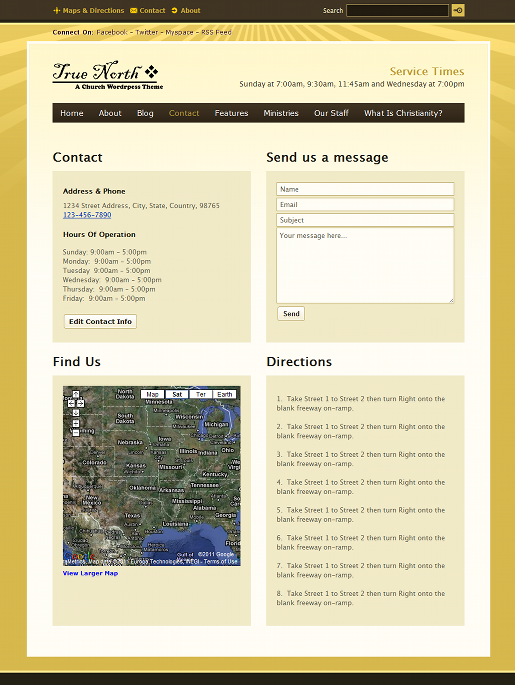 Contact Page. True North is shipped with a fully integrated contact page, out of the box. All of the information needed in order for your visitors to contact you or find details about you is located right on this page.Â It includes a contact form, embedded Google Maps, AddressÂ informationÂ and more! All customizable, of course. Frontpage Image Banner. The Frontpage Image Banner provides you the ability to display in a headline format various content from your website in an interactive and visual display. This feature of your content will catch your audienceâ€™s attention and draw them deeper into your website. In combination with the elegant and simplistic design, this Frontpage Image Banner for True North delivers the optimal headline experience for both your website and your audience. Frontpage Latest News. Display latest news pages, posts or lists of posts directly on your home page! With the Frontpage Latest News feature you will be able toÂ engageÂ your users with fresh content whenever they visit. Frontpage News Ticker. Give your site something extra with an amazing, animated and fully customizable news ticker, right on your home page. You can specifically choose which category to pull your ticker information from. With the Frontpage News Ticker, your users will be enticed to find out whatâ€™s new and what the latest news is on your site. Customizable Footer. True North comes with a fully customizable footer columns area. With the ease of drag and drop, you can add or re-arrange widgets. Optionally included in the footer is a small, secondary link menu which you can control via the ArisTech Panel. Customizable Header. With True North, you have full control over the display of your sites header. You can choose exactly which pages to display within the main naviagation, and you can even optionally have convenient links to your Maps & Directions,Â Contact Us and AboutÂ pages. True North even gives you the ability to choose to display your own logo and text. All this and more to make your site specific to your brand. Team Pages. Team Pages are a way to list the various members of your team. Display images, bio information and more with True Northâ€™s easy to use interface! Frequently Asked Questions (FAQ) Pages. True North comes shipped with the ability to add as many questions and answers to your site, and present them to your users visuallyÂ in a clean and simple fashion. Page Templates. True North has support for full-width templates which removes the sidebar and escapes your page from clutter. You can choose to break up your page or post into multiple pages. Also included are Blog, Contact, FAQ and Team page templates!